Time to Play: 30+ Min. In the 1880's, a rancher and trader named Richard Wetherill became the first white man to explore the ruins left behind by the Ancestral Puebloans of the American Southwest. He called these people "Anasazi", the term used by his Navajo friends. The wealth and durability of these long-abandoned cities, hidden in the maze of rugged mesa, amazed archeologists and explorers. Now you too can join in the exploration of these amazing and mysterious ruins! 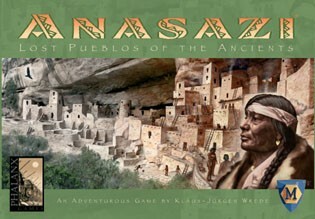 Guide the expeditions from their base camps towards the plateaus sheltering the ruins of the Anasazi. Use your smaller camps to learn more about the vanished peoples as you collect long-lost treasures. But to win, you must be crafty! You won't know the value of the treasures until the end of the game, and each player has a secret goal to reach. Can you win fame and fortune among the plateaus of the pueblos? Or will you be left behind in the dust of history?